Hello and Welcome, Fellow History Lovers. I hope all is well and your summer isn’t a boiling hellhole. This Seams Interesting is a regular column focused on overlooked, weird, and forgotten people and events throughout history. Starting sometime in the 16th century several different peoples from just below of the Sahara, migrated south. They ultimately settled at the bottom edge of the Great Equatorial Forest and the start of the savanna in between the Kasia river – to the east, Sankuru – to the north, and Lulua – to the south, in modern day the Democratic Republic of the Congo. This large group consisted of 18 or 19 different ethnic peoples including – The Ngeende, Kel, Pyaang, Bulang, Bieng, Ilebo, Idiing, Kaam, Ngoombe Kayuweng, Shoowa, Bokila, Maluk, Bushong, Ngongo, and others. Upon their arrival, they came across the Twa. Another people, who were already settled there. Things were civil and the Twa assimilated into the already dense cultural melting pot. 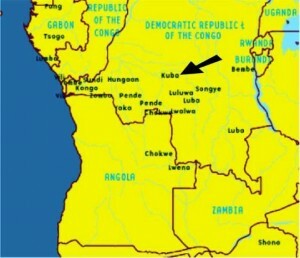 The name, Kuba, originally came from a neighboring kingdom, the Luba. The Kuba referred to themselves as the Bakuba, which translates to, “People of the Throwing Knife.” They spoke Bakuba, a branch of the massive Bantu language tree, consisting of over 200 languages. The other major powers around them were the Kongo and Pende kingdoms, both of whom would prove to be very influential in the formation of the eventual Kuba kingdom. Initially, they were just a loose confederation of separate villages that shared the same culture. There was no centralized government to speak of. They didn’t become a formally organized kingdom until roughly 1625. Shyaam a-Mbul a Ngoong-Shyaam, turned this cultural composite into a kingdom. It isn’t known where exactly he was from, but he was orphaned early on. A local Kuba queen adopted and raised him as a Bakuba. He left as an adult. Shyaam traveled to the nearby Kongo and Pende kingdoms, studying their cultures and political structures. Upon returning home, he revamped his homeland. Some of the renovations he brought were: better iron forging techniques, new crops (cassava, maize, tobacco, beans), multi-branch centralized government, professional military and police, annual census, a complex economy, new tax policies, executive councils, trial by jury, merit-based ranking in government jobs, and bureaucracy. All of this was established without a written constitution. 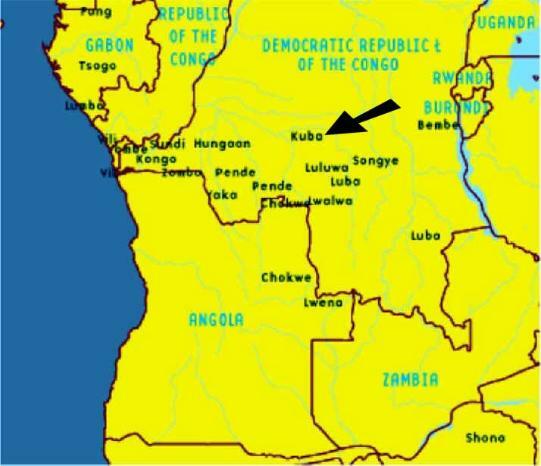 The new kingdom was divided into 9 provinces – Kel, Bushong, Ngongo, Coofa, Pyang, Kete, Shoowa, Ngende, and Nsheng. These were in turn divided into smaller counties. The king, Nyim, was always ethnically Bushong and the capital was where the current king had grown up. Each ethnic group was in turn represented in the aristocratic courts. The queen mother was an essential role in the court. She represented the women on a federal level. The line of inheritance was through your mother NOT your father. That included who would be the next king. The staple of the civilization was weaving, specifically raffia weaving. Raffia was essential for them to survive. Everything was woven from raffia, including the money. That was primarily because of the lack of local metals in the region. 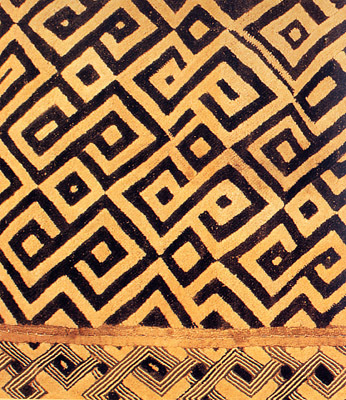 The Kuba designs are the most identifiable aspect of the their civilization. Their designs grew more and more complex as time went on. The Kuba design is perfectly symmetrical and asymmetrical at the same time in a beautiful, mesmerizing way. Once you see it, you can always identity it as Kuba in origin. The size and detail of the design on your house was an indicator of your rank in society. These designs were key in the development of Cubism. Picasso was a huge fan and collector of African and specifically Kuba art. Wood craving and mask making were firmly in second place to weaving. They were equally as intricate and distinctive as the cloth designs. Art in general was highly appreciated and valued. The direction of art was heavily influenced by the Nyim. The most famous case of this was under Nyim Misha mi-Shyaang a-Mbul. He commissioned a new type of sculpture, the ndop. This was a large wooden sculpture of the Nyim. These were made to keep track of the past kings and honor the king. An ibol, personal symbol revealed at a Nyim’s coronation, was always at the forefront. Shyaam the Great’s ndop, prominently featured a mankala board. This represented his cunning, intelligence, and foresight, since mankala requires all 3 qualities. As the kingdom grew stronger, the uniquity of the art grew at a faster pace than rest of society. Religion was a relatively lesser aspect of society. The creator god, Mfcoom/Bumba the Sky Father, created all and more or less left after that. The main deity worshiped was Woot. He was the first man created by Mfcoom. There were other gods but like Mfcoom, they weren’t that formally worshiped either. The Kuba saw the efforts of humanity more important and relevant than that of the supernatural. Everyone was buried with the items necessary for the afterlife. There was no heaven or hell. If you were good, you became a ghost and reincarnated at some point in the future. If you weren’t, you were stuck in limbo forever. The Nyim was the spiritual leader and head of the sorcerers. In addition, they are the head Ngesh, nature spirit, that bridged the divine with the human. Dogs were seen as messengers of the gods and given special treatment above other animals. Primarily the regular diet consisted of fish, given the 3 rivers surrounding them. They regulated the fish population with man-made fish farms, that the women would harvest twice a year along with fishing in the rivers. Vegetables made up the other majority. Surrounded by fertile farmland, there was plenty of irrigation from the 3 rivers. Meat was only eaten during the dry season. During the rainy season, both men and women had to maintain the vegetable crops. Farming was much less intensive, the rest of the year. As with the rest of their contemporaries, they were eventually discovered and colonized. They were one of the last left untouched by Western Europe. In 1892, William Sheppard, an African American Presbyterian missionary, writing about the exploitation of Africans under Belgium’s King Leopold II (That is a story for another day). Sheppard opened the door for the Germans to later colonize the region in 1907. 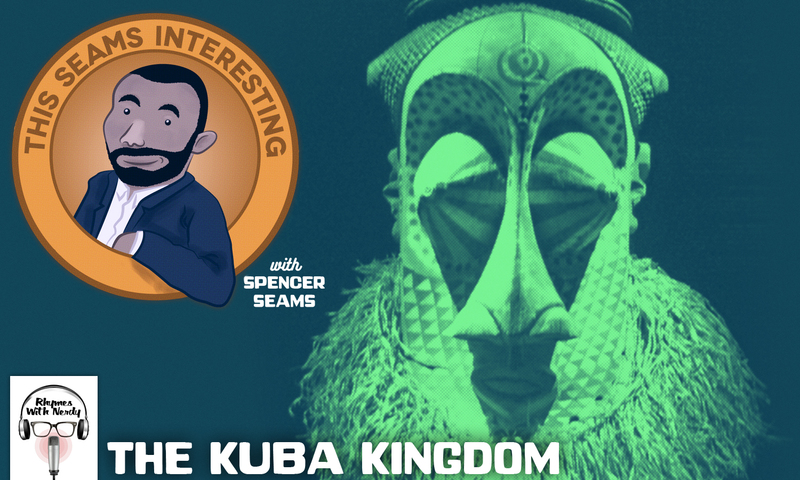 The art regressed and morphed into a more European style but never completely lost its Kuba identity.